Prayer is a mystery. How else can we explain the petition of the Lord’s Prayer, “Thy will be done.” How is that a prayer? Is that not like praying that water be wet or that a sphere be round? Is not the will of God something by nature and definition that is done whether we seek it or not? Some find they are able to answer these questions easily. I don’t. How do prayer and God’s sovereignty exist in the same universe? It is the question that troubles many who find their way to their knees. But to pray within this tension is what we are called to do, even as the Lord’s Prayer makes clear. Crump makes the necessary point that the first three petitions of the Lord’s Prayer all are making somewhat the same point. To pray that God’s name be honored is to pray for his kingdom to be manifest in all the earth, which is to pray for his will to be done, and all of this on earth as it is in heaven. But does this imply that his will is not being done? Does it imply that we can, by our prayers, hasten the coming of his will and kingdom? Those are complicated questions which find some de-tanglement when we understand that this prayer for God’s will was central to Jesus’ impassioned prayer in Gethsemane. To pray for his kingdom and will to come and be done is in many respects to pray that our hearts be submitted to him, that our desires be his desires, that our personal impulses be submitted to his greater vision. And yet, I’m not completely satisfied by this. It does not completely give me rest to suggest that when I am praying, I am simply putting myself in a place where my heart and passions might be changed and molded. When I see brokenness and injustice and anguish among God’s people, I pray that HIS KINGDOM come. I am praying that he would bring more into the ‘already’ the ‘not yet’ realities that will dry those tears and heal those broken hearts. I pray that his will be done because in many respects is is NOT being done yet, no matter what we make of the mystery of divine providence. All is not as it should be, and so I pray that God would hasten the day when it is. And I am encouraged to pray that, and to pray it with vigor. Whether Crump would embrace the above paragraph or not I can only guess. I sense that he would. We must avoid every sense that God’s responsiveness is only apparent. Those who suggest that “God ordains the means as well as the ends…” are, he says, giving a theological answer aimed at intellectual satisfaction at great cost to the biblical text. And Crump’s desire to always lean on the text even when our minds are left reeling is part of what I appreciate about his approach and his honesty. That is where I want my heart to be. It is too easy for us to treat prayer as a skill to be learned when it is better thought of as the fruit of a relationship that is nurtured. It is something the children of God do with their heavenly Father. That is what is at the very forefront of Jesus’ most formal teaching on prayer which we call ‘The Lord’s Prayer’. My (albeit simplistic) take on this prayer has always been that Jesus here, in modeling prayer for his disciples, also models for them the longing of the righteous heart. If these are the things for which we ought to pray, then these are the things fundamentally our hearts should be trained to long for. First and foremost, this prayer trains our hearts to approach God as our father and our king. The image of God as father is for some very comforting and for others problematic. Jesus introduces the term here not to convey a simple paternal sensitivity (and Crump does a good job of disavowing us of any notion that Jesus encourages us to call God ‘Daddy’) but to present the Father in heaven as both creator and redeemer, as Lord and as king. He stands as the one who loves and the one who commands. We come before him with awe even as we come boldly. As Jesus teaches us to pray “Our Father” he invites us to enter into a relationship with God not analogous with our own troubled father-child relationships, but analogous rather of the intimacy between Jesus and His Father. He invites us to enter into prayer as he experienced prayer. We are to approach God not as we might approach our own fathers, which is quite hard for some of us, but we are to approach him as brothers and sisters of Christ. We are to approach God as Jesus approached God, as his father, as the one who loves him, and as one he loves, whose will he respects and keeps. We are to step away for a time from our own flawed and broken imagery of a father and come to God upon a foundation built of the revelation of Jesus’ relationship to the father. This can be freeing. Often those who are good at something are not the best teachers. They can only tell us how they do something and cannot lead us through the painful steps of getting to where they are. But we can learn a lot by watching and listening to them. There is a man I know whose prayers lack sophistication and style. But I love to hear him pray and am comforted to hear him pray for me. That is because when he prays, he is clearly talking as a child to his father, and that seems to capture better than anything, the essence of prayer. He learned that by listening to Jesus. I want to do the same. Years ago, I heard a man speak whose church had grown phenomenally. He attributed this growth to his commitment to spending hours daily in prayer, a commitment in which his church had joined him. A correlation was drawn between the number and persistence of people praying and the success of the church’s ministry. I was moved by the man’s faithfulness. I was challenged by his model. But I was never able to duplicate his devotion or his success. I am left to wonder: if I’d prayed one more day or had one more person join me, would we have tipped the scale in our favor? What, that is, is the price of a miracle? Or is that even a proper question? Some have read Jesus’ parables in the gospel of Luke (chapters 11 and 18) to suggest that prayer not only requires a special quantity of faith but as well particular investments of time, repetition, and emotional fervor. And such quantification seems to put a price tag on the miracles we seek. Is it really true that what God will not do if only ten are praying he will do if there are eleven or twenty? To have many praying, and praying long and hard is a good thing. But the line between doing what is good and attempting to manipulate God can be invisible to us if we are not careful. Crump unpacks these parables and in so doing helps us see our way beyond this creeping mechanistic view of prayer. The point of the parables of the friend to who seeks bread from his neighbor at midnight (Luke 11) and the widow before the judge (Luke 18) is not that we can with our persistence irritate God into action. Rather, the point is that we should come to God at any time and with whatever need without shame and without hesitation. We are to let nothing prevent our bringing our petitions to God. We will be persistent and we will pray without ceasing because we care about the matter at hand. But we do so not to pay a certain ‘price’ for a miracle. Our Father is always and ever willing to hear and to give what we most need. The encouragement of these passages is to pray. We are encouraged to pray not so as to up the ante against God so that he must respond, but to pray knowing that he loves to give good gifts to his children, even when all we can see is darkness. Faithfulness in prayer is what is encouraged, and faithfulness is always more precious than a mechanistic persistence. The child who asks and asks and asks her father for a snake will not get it. But the child still asks, and the child will get what she most needs. But she asks not to up the pressure on one who will not give, but she asks simply because he is her father. When do we eventually entertain the idea that Jesus has lied to us? Few would confess to having this thought, but many face it. We read in the Bible that Jesus said, “Truly, I say to you, whoever says to this mountain, ‘Be taken up and thrown into the sea,’ and does not doubt in his heart, but believes that what he says will come to pass, it will be done for him.” (Mark 11:23) And so we pray, with earnestness and fervor and persistence and faith. And the “mountain” remains. We may not exactly accuse Jesus of lying, but we will judge the text to not be true, which effects the same thing. And left unchecked, the thought will find a place to roost, and grow, and soon we will stop praying. Or worse. But the problem is this: what other conclusions can we draw? Jesus says one thing and our experience reveals another. The fault is either in us not praying right or in the promise being faulty. What is it? Gently, Crump points us in a third direction – that we have misunderstood the nature of the promise. He takes us back to the texts in which the apparent links between faith and prayer and the work of God are drawn and helps us see them in fresh ways, hopefully in the way that Jesus meant them to be understood. Crump walks us through the texts to see if it is in fact possible for Christians to cause mountains to ‘do backflips’ into the Mediterranean as easily as Jesus caused the fig tree to wither. Crump helps us to see that Jesus’ point was not that a physical mountain would move, but that the personal God would act. The common believer has access through prayer to the full power of God. There are no limits. The point is that we ought to expect that our prayers do connect us to all the power of God, no matter how weak our faith. But that does not seem to be helpful. Why do the mountains not move when I tell them to? The answer is, “God.” Regardless of what we ask, it is his decision to act in all the wisdom that is his. No where in the Bible does ‘greater faith’ receive greater answers and ‘lesser faith’ lesser. Scripture invites every believer, no matter how weak his faith, to believe in the absolute power of God. There is no guarantee “expressed or implied”. There is a future sense in the promises of the Bible and, as hard as it is to accept, sometimes the answers to our prayers await the coming of the kingdom in its fulness. The challenge here is to avoid the cynicism that says God cannot or will not ever bring the impact of that kingdom to bear upon the present. We are encouraged to ask things of God, believing that he, as God, can do what we ask. But God is not bound by what we ask. Greater faith or (as we will see) greater persistence does not obligate God. That is the point we need to hear. Faith does not change things, and prayer does not change things, but God does. Prayer is taking what little faith we have and what little we know of prayer and asking the God who can move mountains to act. Even when we cannot receive what we ask, as Jesus’ prayer in Gethsemane demonstrates, we are to pray. But we pray believing that he can if he chooses do all that we might desire. He who is truthful in all else that he says is truthful here as well. Prayer is life for the Christian. It is the spontaneous and necessary cry to God arising from the struggles and hopes and failures and dreams of living in a broken world. Prayer is something we cannot imagine being without. At the same time, prayer is a mystery. It is a discipline and it is hard. And for most of us prayer is a weakness which becomes, in the end, a burden. But is prayer a weakness because it is hard and unnatural for us, or do we find ourselves weak in it because of a misconception of what it is to be? If one trains to be a painter using a faulty and impossible standard, even though he may be good he will judge himself to be weak because he is using erroneous evaluative criteria. Perhaps we are overly critical of our practice of prayer because we are building our critique upon a false model of prayer. Any book that would seek to correct our false ideas of prayer could, in fact, free us to pray. Such is, in my opinion, the value of David Crump’s Knocking on Heaven’s Door. It’s not well known, but surely any book whose title riffs on a Bob Dylan song is deserving of at least a glance. A glance was all I needed. 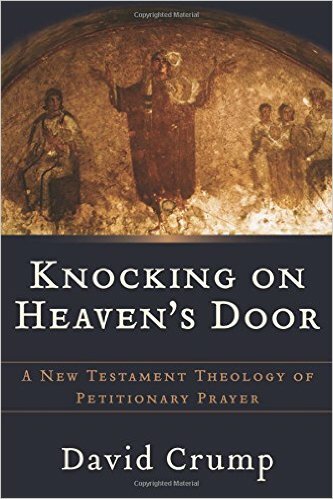 The book’s subtitle promises that this is “A New Testament Theology of Petitionary Prayer”. David Crump, a professor of religion and theology at Calvin College in Grand Rapids, Michigan, sets out to ‘explain’ prayer as it is presented in the New Testament, which means rescuing prayer from the misconceptions of a well-meant but often mistaken evangelical and fundamentalist heritage. Crump treats that heritage with respect, but his commitment is to Scripture, and it is in opening the Bible to careful attention that he excels and is most helpful. In reading (and then re-reading – VERY rare for me) I found his explanations of the biblical text careful and thorough and his conclusions convincing. And this book did what few other books on prayer have been able to do. It made me want to pray. In this case, it made me want to pray not because of the effect prayer has had upon some great saint, and not because of some great promise made about prayer. It made me want to pray because I was able to better see it for what it is, and God for whom he is. I run with the hope that it will help me live, not because I particularly enjoy it. The only ‘runners high’ I ever get is the exhilaration I feel at being done and knowing that I don’t have to do it again for at least two days. When I passed him again he said that in truth he would do what I was doing if he had not had a knee replacement. I pointed out that I ran because both my parents died of heart disease. As I ran off, I thought about our two situations. And I wondered whether having a good dog might be a better preventative against stress-induced heart disease than running. Being a pastor, as I am, is in many respects a sedentary job in which people want to feed you a lot. Pay a visit to someone and they offer you cookies or brownies. Offer to meet someone and they suggest you meet over lunch or coffee. Pastors do a lot of sitting and eating and therefore exercise, of some sort, is essential. And so I run. Someone ‘accused’ me the other day of ‘liking’ to run. I don’t, really. I love to have run. But running itself is something else. I run because it is good for me (though I’ve needed some pushing recently) and because it has become for me a habit. It is a discipline (something we’ve addressed sporadically before in these pages) which from frequency has become a habitual routine I am loathe to lose. What is the habit of running accomplishing for me? When I run, I hope I gain a stronger heart. But I know that I gain insight. Since I don’t listen to anything when I run, my mind is free to wander. And in wandering, it wanders its way into solutions I don’t think I could have found in any other way. I’ve solved insoluble pastoral conundrums when I run. I’ve re-written whole sermon outlines, ones that had resisted more linear analysis. I’ve mapped out financial goals. I’ve written blog posts. And sometimes I’ve done none of the above. When I run, my mind is set free to solve problems by looking at them obliquely and not directly and the time is available to do so. 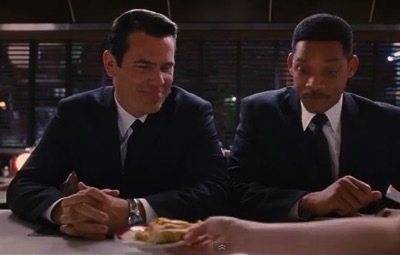 In the movie Men in Black 3 Agent K (Tommy Lee Jones / Josh Brolin) illustrates this point by taking his partner, Agent J (Will Smith), to a diner where he orders pie. He’s convinced that the best way to solve a problem that is resisting a solution is to not look directly at it but to put it aside and let the answer come over a piece of pie. “Trust the pie” is his mantra. Mine is, “Trust the run.” And that may be one of the few things that keeps me running. Late in high school I began to read the Bible with a pencil/pen and paper in hand. I don’t know who suggested I do this, or if rather the idea just spontaneously combusted in my still unformed brain. Whatever prompted it, it stuck. Some time later it occurred to me that there was more value in reading the Bible slowly than in reading it fast. Again, I’m not sure whether this was a conclusion independently drawn or drawn from another’s wise words. Nevertheless, it too stuck. Both ideas have been a gift. My current practice is to each morning read a small portion of Scripture, perhaps a chapter, perhaps a portion of a chapter. I opt for bite-sized chunks that I can savor, think about, reflect upon, and remember. The thoughts stimulated by these reflections get recorded in the journal open in front of me and often morph into words of prayer. I’ve done the ‘read through the Bible in a year’ thing and found it too easy to not pay attention to what I’m reading. I’ve decided to be the tortoise, casually reading through the bible once every four to five years, meditating upon it along the way. Hares consume at a much more rapid pace, but this serves me well. And it has served others well. Tim Keller suggests a reason why. In his book Prayer (in which I was largely disappointed, but not completely), he expresses a concern that we too easily separate our reading of Scripture from our prayer life. He challenges Christians to engage in the reflective and interactive approach to Scripture known as meditation. As we meditate on the text God speaks to us, and, subsequently, we pray moved by what we ourselves have heard. It is, as Keller rightly notes, a conversation. Sometimes, Keller reminds us in chapter 10 of that book, we are content to grasp what a passage says and don’t take time to think about what the passage says ‘to me’. And that leaves us impoverished. Recently in preparing a sermon I was confronted with the challenging words of Jesus, “One’s life does not consist in the abundance of his possessions.” (Luke 12:15) It would be easy to treat that text in the abstract and to simply accept that this is something Jesus said and be content to assume we know what it means. Far more value comes from chewing on such a text and asking questions that impinge upon one’s own heart attitude toward possessions. Do I care more for my things than I do for God? If I lost my things would I still trust God? Which is the greater source of my happiness: that I have things or that I belong to God? And so forth. It is true that we cannot see God, and, as someone recently told me, it feels artificial to attempt to speak, to pray, to someone we can’t see. I get that. But meditation helps us hear God so that, though I don’t see him, I hear him. And the one I hear, to him I can speak in reply. Grab a bible, a pencil, and a composition book. Set aside some time during the week. Once. Thrice. Daily. Read slowly, listen, ask questions, respond, and pray. And you can forget who made the suggestion. The world is divided into three groups: the good, the bad, and the different. It’s easy to see ourselves in the first group, many others in the second, and to virtually vacate the third. The reality is far different, of course. There are things that are morally good and things morally bad. 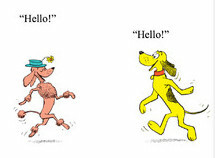 But many of the things on which we differ simply are, well, just different. Robert Boughton, the aging Presbyterian minister in Marilynne Robinson’s remarkable series of novels of the single word titles, Gilead, Lila, and Home, is said to never have found a moral instruction that he did not then feel obliged to give to his congregation. I feel some of the same impulse as I consider the subject of discipline. When I find someone who has trouble engaging the Bible or being frequent in prayer or comfortable in worship, I want to immediately tell them what I do, for since ‘what I do’ works for me, no doubt it will work for them. Well, maybe so and maybe not. People are different. I fall asleep once the clock passes 9PM, and my wife is still going long after midnight. I find the solution to all of life’s problems involves a spreadsheet or a list, but she finds lists the instruments of the devil’s torture. So, I get that we are different, and our differences affect how we practice the spiritual disciplines. Asking my wife to have her ‘quiet time’ in the early morning would be met with incredulous laughter. I don’t know if what I ‘do’ would help you, or anyone else. I’m willing to suggest it might, but if you are struggling with spiritual disciplines, find someone whose life you respect and ask them to tell you what they do. You might find something you can emulate. And the chances are that the first attempt at imitation will be hard. Any new discipline will feel like a stiff new pair of shoes. We can only tell they will be lifetime favorites after wearing them for a while. So, go to your respected friend, learn what they do, and give it some time. Years ago, I recruited some people from the church I then pastored into a study group that included some wonderful help in the practice of the spiritual disciplines, help that continues to impact me to this day. Two-thirds of the way through that material two women in the group kindly pointed out that my preaching had improved during the course of that study. I was grateful, and I thanked them. The truth was that my preaching had not changed, for good or ill. What had changed was their spiritual receptivity. Because of the demands of the study material they had applied themselves with greater regularity, greater discipline, to times of scripture and prayer. This had opened a softness in their soul that made them far more able to hear God’s word elsewhere, even in subpar preaching. If discipline was easy everyone would be doing it. Somewhere I think Elisabeth Elliot said that the happiest people she knew were athletes and musicians, because of their deep habits of discipline. But discipline is hard, and I’m neither a musician or an athlete, and so I’ve looked for a shortcut. For the easy way. I’ve wanted something of the flavor of my friend Jim Lucas’ walk with God, for that kind of depth and joy. And I wanted it easy. I searched in books. Charles Colson’s Loving God promised a deeper and more meaningful walk with God. But there was nothing easy about it. I scoured Gordon MacDonald’s Ordering Your Private World looking for the easy path. The book was deeply meaningful to me, but it had nothing to do with ease. Later I had the opportunity to attend seminars by ministers highly respected for their contribution to a modern understanding of church leadership. Their insight was profound, their suggestions practical, their impact upon my ministry lasting. But each, in their presentations, let slip that they were students and practitioners of the spiritual disciplines, and what they spoke about them did not sound easy. I was beginning to discern a pattern. I remember hearing John Piper once say, years before he became THE John Piper, that any spiritual insight he had, had come to him as a result of his many hours of writing his thoughts in his journals. I might say for me that if there is any genuine spiritual quality to my life, it is due in large measure to the disciplines, weak as they are, that God has built into my practice. And yet, the benefits are not due to the disciplines, but to the work of his Spirit who works in and around and through the practice of the disciplines. I’ll never say that the Christian life is easy. Far from it. But there is fruit that makes discipline, in its time, worthwhile. Even for Ollie McLellan.